Sign up for our email list and receive a FREE quilt pattern. The 7th Annual Sew Deja Vu Sewing and Quilting Retreat is scheduled for June 14-16 at the Hilton Garden Inn in Twinsburg, OH. The Hiltons accommodations are nice and cushy and the surrounding grounds are simply lovely in June. The Ballroom is beautiful with a wall of windows with natural light. Of course we sampled the food and it was perfect. Pricing is $329 for a double occupancy and $429 for a single occupancy. A deposit of $150 is due by May 1st but please remember that space is limited. Cadence Court Block of the Month Full Kits are Now Available! 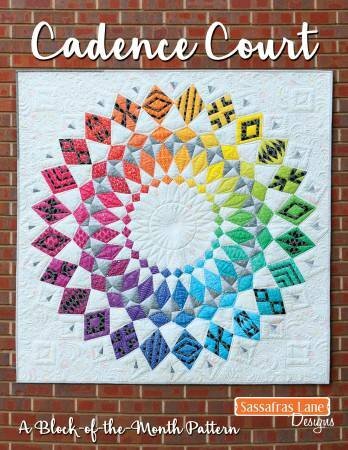 Kits are now available for the Cadence Court Block of the Month Quilt! This quilt is paper pieced and finishes at 60" X 60". With this pattern, you will make 24 total wedges featuring 12 unique designs. Kits are limited and includes fabric for the quilt top. Welcome to Sew Deja Vu! Judy Phillips and her girls (and you know who they are) are here to inspire and take your creativity to a new level. We are abounding with fresh new ideas, classes and the trendiest fabrics you’ll find anywhere! We are looking forward to being your premier sewing and quilting boutique!